Finding female empowerment in schools can prove difficult, but through the hard work and dedication of school clubs and organizations, female students can feel more empowered than ever before. With an already hard to navigate atmosphere, high school proves as one of the most stressful times in a female’s young life. Trying to find a place to fit in and feel comfortable can seem daunting to freshmen, and with the expectations placed by society, social media, and pop culture, high school only becomes more stressful. Not following the latest trend or embodying what people see as beautiful isolates those who strive to stay true to themselves. “Most people have their own unique sense of style, so not every trend is probably going to fit into their life, but at some point those people may start to feel left out,” freshman Savannah Blanco said. Female students struggle far more than male students when trying to fit it, and trying to live up to every minor expectation seems nearly impossible. For four years, female students attend high school but struggle to find places where they feel they can express themselves and their femininity. The high workloads given to students cause extreme stress, resulting in an increase in anxiety and depression disorders in female students. Even though male students do experience stress, its effects hit female students harder. Stress causes women to convey symptoms such as headaches, the urge to cry, or an upset stomach, while men carry their stress and show little to no physical symptoms. Women feel the effects of stress more than that of men. According to Psychology Today, stress disrupts a person’s healthy coping mechanisms. With the already high amount of hormones racing through a female teenager’s blood, stress only makes mood swings worse. Stress leads female students into not finishing their work, ultimately leading to feeling a sense of failure and guilt that can lead to increased anxiety and depression. Public schools do a poor job in providing their female students with hygienic dispensers with pads and tampons in bathrooms. The missing acknowledgement from schools forces teen girls who need a feminine hygiene product in a hurry to ask a friend or call home. At NC, the scarcity of feminine hygiene products available in the clinic only further aggravates the situation. Female empowerment cannot even begin to exist in schools when girls must feel shame for a bodily function they cannot control. “If you think about it on a grand scale, there’s 2800 kids here, and over half of that is females. If we were to buy them [feminine hygiene products], to keep sustaining students at school, that’s a great cost… in the grand scheme of things it’s just very expensive to keep up with,” NC nurse Fikera Gerald said. Clubs revolving around acceptance and empowerment of one’s womanhood provide girls with a safehaven at school. NC houses clubs such as Girl Talk and What About Women that promote female empowerment and positivity. 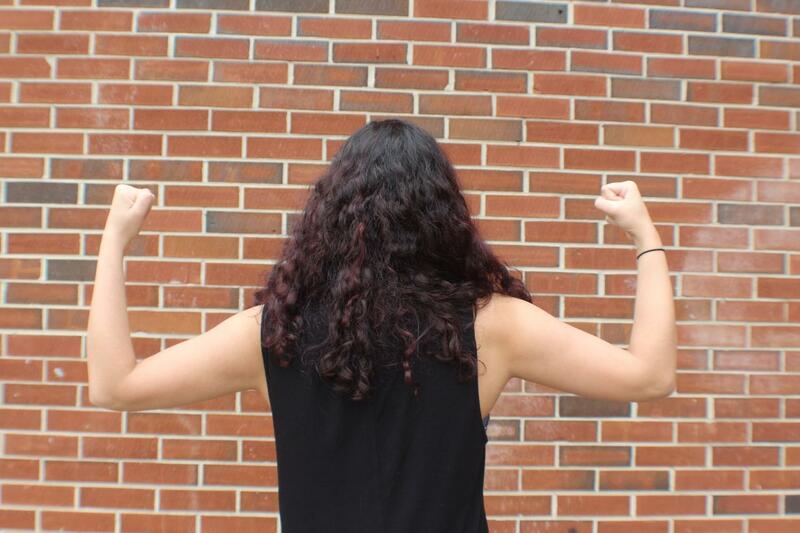 Early this year, juniors Tara Anastasoff and Isabella Keaton started the club What About Women in attempt to prompt school leaders to install feminine hygiene dispensers in the girl’s bathrooms at NC. “I wanted to try and get feminine hygiene dispensers in the bathrooms because there was a need for it, and I felt like it was not okay for us to not have them since they were available everywhere else except schools,” junior and club leader Isabella Keaton said. Since the beginning of a child’s school career, dress codes place girls under the microscope for what they wear to school and how it affects other people. Female students may not wear leggings, shirts that show too much shoulder or cleavage, and shorts that do not pass the fingertip test. A major part of confidence for girls comes from what they wear to school, so limiting what they wear puts a huge damper on feeling empowered in one’s own skin. Hearing reprimands for wearing what one wants damages self-confidence and can make a girl feel awkward in her own skin. Through it all, the subtle message sent to teenage girls is that they must cover up to prevent from distracting their male counterparts or because the female body possesses no beauty. “Delete the dress code. Focus on the fact that guys stare at girls. Girls are their own person, and if guys focus on girls and get worse grades, then that’s on them. Don’t take it out on females because when you make girls cover up and feel like they need to hide then schools destroy a female’s confidence and self-esteem,” junior Alexcis Critten said. The introduction of female role models, such as teachers, counselors, etc., gives students a person to confide and put their trust in at school. Teenagers spend most of their time at school, and role models can spark a passion for leadership in adolescents. In addition, female role models provide helpful advice academically and socially, which aids in confidence level and ultimately leads to feeling empowered. Creating an environment that empowers female students is of the utmost importance and can make or break their high school experience. Female empowerment benefits girls after their schooling by transforming them into active citizens. It will make their voices heard when it comes to topics they show passion for. It builds character through problem solving, trusting their own perspectives, and staying true to themselves. Girls who question racing issues such as racism, sexism, and homophobia show a healthier psychological profile. In high school, relationships become more important to budding teenagers than ever before. Boys and girls begin to view each other in a much different light, which leads to healthy young relationships or toxic ones. Although objectifying women does not only affect schools, the root for it stems from how men act and treat women in their adolescent years. Objectification makes women feel powerless and shameful in their own skin, making it difficult to feel comfortable as a person. Staying true to female empowerment becomes a challenge when women face feeling inferior to men in romantic relationships. The derogatory manner that students learn sexual education places women on a pedestal as all sharing characteristics when on their menstrual cycle. The common conversation of “oh she’s in a bad mood; she must be on her period” stereotypes teenage girls at school, which continues the trend of stereotyping girls on their menstrual cycle. Every girl possesses different symptoms before and when on her period, so putting the notion that all girls display the same symptoms from their menstrual cycle in teens heads only stereotypes women more. Stereotypes lead to women internalizing what others think about them, and when someone hears them, they only start to believe them more as time passes. How can teen girls even begin to feel empowered and strong when society pushes them all into one single box? Saying that they all resemble one another and don’t possess their own characteristics lowers self-esteem by insinuating that girls do not carry individual personality traits. “It’s simple ignorance. People don’t understand it, and it’s easy to blame it on something they don’t understand. Especially men, they’ve never dealt with it, they’ll never have to. They’ll only get close to really understanding through the women in their lives,” junior Abigail MacAnn said. 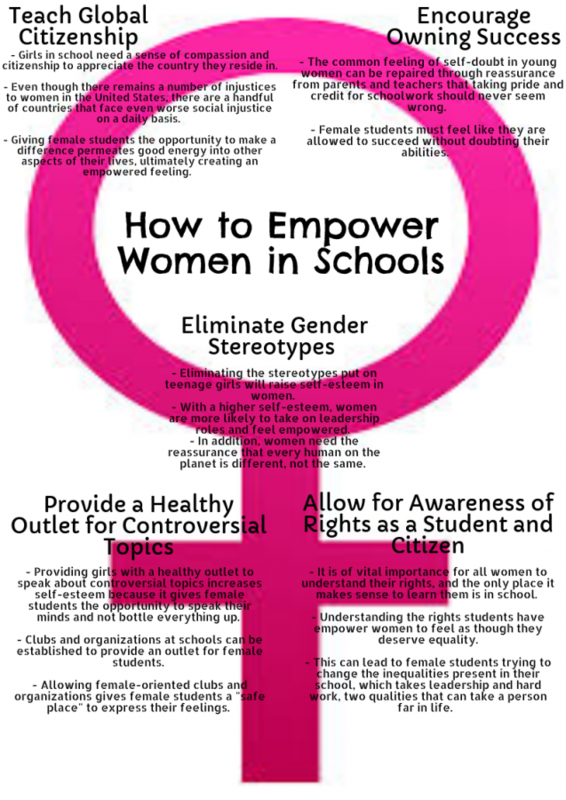 Overall, females need to feel more empowerment at school. The simple fixes that can make or break a student’s high school experience take little to no effort and make all the difference from a day to day basis. Although clubs do provide a temporary safe haven for girls, the problem still lies within how female students view themselves due to underlying factors like social media and their peers. Schools taking initiative to make the necessary changes to make girls feel more empowered while learning improves their educational performance. Girls make the world go around, and learning how to feel empowered as a woman from a young age hold vital importance in keeping the female population alive. To keep the initiative of empowerment alive, schools must provide teen girls with positive reinforcement and women proud of their natural-given gender. “I understand that we [female students] can’t be like exposing everything, however some of the codes against showing small amounts of skin, whether in the mid-section or shoulders, is a bit much. The school should be empowering us through hyping up girls sports and not making females feel uncomfortable in their clothing,” sophomore Faith Jean said.